Candi, a German Short Haired Pointer, was our family dog from the time our children were toddlers until they were in high school. She was both loving and loved (spoiled), intelligent (at least the kids thought so) but loyal as only dogs can be. Moose: well, he looked like a Lab until you looked at his head. It seemed to indicate there was a Great Dane somewhere in the woodpile. When my sister came to live with us, he was part of the package. Moose was loving (among family members), intelligent (in a doggie sort of way) and boy, was he ever loyal. The Animal Control Center has published a most informative article entitled Caring for a Dog. Every dog owner should read this as it is not only full of good tips but informs the pet owner the best way to maintain your dogs good health, good manners, good grooming and other responsible duties. Unfortunately for us, we did not have this good advice. I am now going to quote from Caring for a Dog and then compare our family’s dog raising method (method may be too strong a word). Quote: A crate is a playpen, bed, toy box, a home away from home, and a house training aid. Our way: Neither of them had a crate except one time Moose did when he flew from Colorado Springs to Chicago. He didn’t care for it. Their playpen and home away from home was northern Indiana. With the exception of one Beagle named Sniffy, Candi didn’t like other female dogs and would not allow them in our front yard. Sniffy was pregnant most of the time but after the weaning process, her owners would let her out for a “run”. She ran straight to our house and away they went. In the early years, they would be gone as long as three days. The last “run” they took many years later lasted about four hours. Our dogs’ beds were next to ours, their playpen the entire house, their toy box non-existent. Somehow they got house trained. 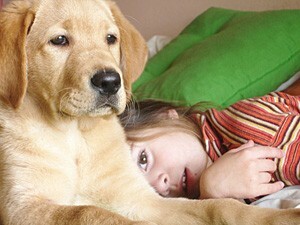 Quote: Pet your dog often (while grooming), brushing out tangles in his fur. Left unattended, they can develop into problems. You may hire a groomer to bathe, clean ears, trim nails, and cut hair. You can even brush your dog’s teeth with dog toothpaste. Our way: A swim in Lake Michigan was a bath and that’s about it. They both had short hair. Quote: Your dog should see a veterinarian when you first adopt him. This helps him become accustomed to the office and procedures so that the animal hospital does not become an unpleasant experience. Your vet will let you know if your dog needs any dental care or other routine maintenance such a prevention of treatment of parasites common to your climate. Our way: Both dogs had their shots, Moose was neutered and Candi was spayed. Candi’s one serious trip to the vet was when she was poisoned. The vet kept her several days and, when he called to tell me she would be all right, I called the school and asked them to tell our kids. Apparently, the principal just got on the intercom and said, “The vet says Candi will be fine”. Moose, when still living in Colorado, just couldn’t resist messing with porcupines so he made several trips to see the vet. 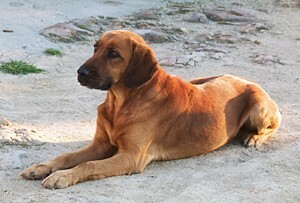 Quote: Dogs live much longer now that they are kept indoors and on leashes and are fed commercial dog food. However, no food can contain everything that every dog may ever need. Since changing brands or flavors can lead to stomach upset for your dog, a good way to be sure you dog is getting the best nutrition is to use one brand of dry food (good for his teeth) and supplement it with another brand of canned food (good for his coat and more appetizing.) Table food should not make up more than 10% of your dog’s intake or it will reduce the value of feeding a balanced commercial diet. Our way: I can’t speak for Moose’s early years but once he got to our house, he ate the same thing as Candi which was 20% kibbles and 80% leftovers. They seemed to like it and weren’t fussy eaters. Though they each had their own dish, Moose let Candi know he ate first and she (wisely) agreed. Candi ate anything edible and many things that weren’t such as crayons and socks. There were huge mulberry bushes between our house and the one next door and, from our second floor porch, she could reach over and eat the berries. From Thanksgiving until the first of the year, I kept a bowl of mixed, unshelled nuts in a bowl. She liked those too and could shell them as well as any squirrel. Once, we lined up one of each of the different kinds. Her first choice was pecans. For a while, I kept nice, fresh water in a bowl for them but they never even looked at it. They went straight to the toilet. Quote: You will naturally train your dog just by living with him. You may want to start with a basic lesson before you begin formal schooling. Once you learn more about animal training you may decide to go to an obedience class. A class is a great place to introduce your dog to other dogs. Our Way: There was much more to this part of the article but I might as well stop where I did. They would both sit and shake hands but they were drooling the whole time. I do think Moose minded better than Candi. Obviously, if I had to tell her “no” or “stay” or “don’t do that”, it’s because she was about to do something she wasn’t supposed to or I didn’t want her to. Too late. Her plans were already made. We did nothing by the book. At that time, if dogs wanted to go outdoors, they scratched at the door. Though they really weren’t supposed to roam at will, there was no leash law. Candi always went out when she wanted and when Moose got there, we tried that for a while. They got into trouble. We also got into trouble sometimes when Candi was out roaming all by herself. She loved to eat garbage and that pushed most folks spirit of generosity a bit far. She had terrible “table manners”. Even though there were many complaints, I never heard about them until I was leaving the area. To be honest, I had heard some rumors. As we were driving out the gate, I stopped to tell the gatekeeper we were on our way. He told me our dog had the longest record of reported complaints of anyone or anything in the history of the town. I have mixed feelings about that record. Freedom is a wonderful thing. I guess we must have done something right though. Both of these wonderful dogs lived to a ripe old age.